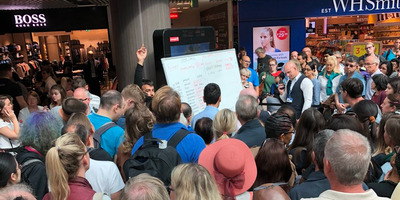 Edmund von der Burg/TwitterStaff at Gatwick Airport had to write out flight departure information on whiteboards after the screens stopped working. All the screens at Gatwick Airport stopped working on Monday due to a damaged fibre cable. 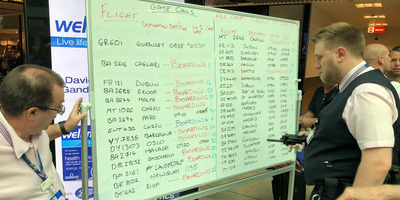 Footage on social media showed staff writing out the flight status of each flight and rubbing them off as updates came in. A “handful” of people missed their flights, but tens of thousands of other people managed to catch their flights on time, the airport said. The screens at the UK’s second-largest airport stopped working on Monday, forcing staff to write out flight departure information on a whiteboard. Both the north and south terminals at Gatwick Airport, London, were affected by an IT failure that led to its screens not working, the airport tweeted around 8:30 a.m. on Monday morning. The problem was caused by a damaged cable used by the airport to display flight information, a spokeswoman told Business Insider in a statement. As of 12:30 p.m., the issue had still not been resolved. 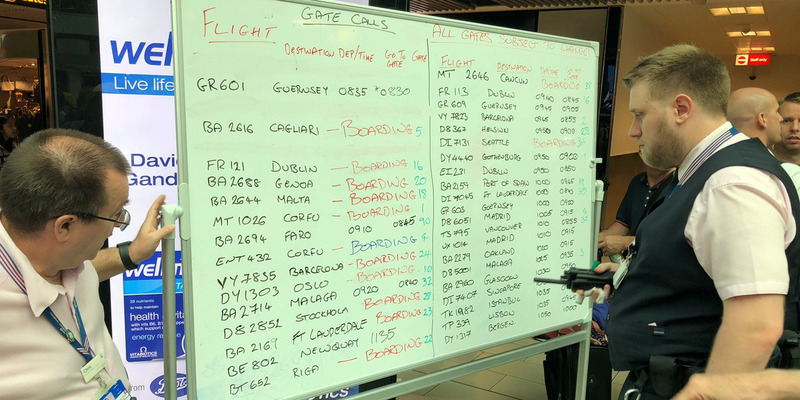 Photos and videos posted on social media showed airport staff updating flight information by listing flight numbers, destinations, status, and gate numbers in black, red and green ink, and rubbing the writing out and updating with new information as they came in. Footage showed dozens of travellers surrounding two whiteboards at the south terminal as staff answered calls and updated the flight statuses. “A handful” of passengers missed their flights due to the screen failure, a Gatwick Airport spokesman told Business Insider. However, he added that “tens of thousands” of passengers managed to catch their flights and depart on time. Edmund von der Burg, a passenger from Stockholm who was at the airport, tweeted that the staff were “all very helpful and dealing with the info screen fault well,” but suggested that they share the departure information via Twitter. Some 45.6 million passengers travelled through Gatwick Airport last year, according to statistics from the Port Authority of New York and New Jersey. It is the second-largest in the UK in terms of passenger use, the UK Civil Aviation Authority reported, and 33rd-largest in the world, according to the Port Authority. A Gatwick Airport spokesman told Business Insider: “Due to an ongoing issue with Vodafone – a provider of IT services for Gatwick – flight information is not being displayed correctly on the airport’s digital screens and is currently displayed manually in the terminals.